Map_Paper is rated 3.8 out of 5 by 5. Rated 5 out of 5 by Edmo from Something Different I've always loved this paper, along with the matching envelopes, as its different and it definitely gets noticed! Rated 3 out of 5 by dg23 from Good paper. I was pleased with the overall paper quality, but I did not understand that the package of 100 would have only 3 different maps. For the reason I purchased I was somewhat disappointed. Rated 5 out of 5 by Joey S from So different This is great that it is actually "map" paper. Different every time, really authentic! Rated 1 out of 5 by Lindsey from Not actually what is in the pictures. I am not very happy with this purchase. The map design in the pictures is not at all what is on the actual paper! Rated 5 out of 5 by EFLH from A Favorite! JAM Paper has the items I like using a lot. The map paper is one of my favorites as its different, and it certainly gets attention! The map paper is still in stock. We would be able to, but the shipping would be pricey. It would be beneficial for you to have a UPS or FedEx number! Hope this helps! I'm looking for map cardstock - like the weight and thickness of index cards. Is this item more like regular paper? Yes, it is 24 lb. paper, so it is a little thicker than your average copy paper. Surprisingly you can print on this and have it be legible. But if you are uncomfortable doing that on the map side anyway, the other side is blank! Unfortunately we don't have 6x9 in stock. And our packs come in 25 sheets. Sorry for any inconvenience this may cause. Can I specify Adirondack High Peaks? Unfortunately, all packs are assorted and it is not possible to buy specific map locations. I don't suppose there is any chance of getting these in 5x7&quot;? Sorry, these are only available in 8.5 x 11&quot;. We would suggest our #10 envelopes, which would be the closest in size to a standard envelope to New Zealand. Lost? 0 Clue where you are? Your GPS isn't working and your phone is dead. Well, there's always one thing that doesn't disappoint or stop working: maps! And this Map Paper doesn't disappoint either! Not only is our Map Paper one of our highest demanded products, but it was also featured in New York Magazine’s “Best Bets.” Made from real surplus land maps, this map paper is the perfect alternative to standard white or loose leaf paper. Real estate agent trying to promote your business? Use this paper as a flyer background! Obsessed with land and want to create an art piece all your own? Use our map paper. Map paper has many uses! 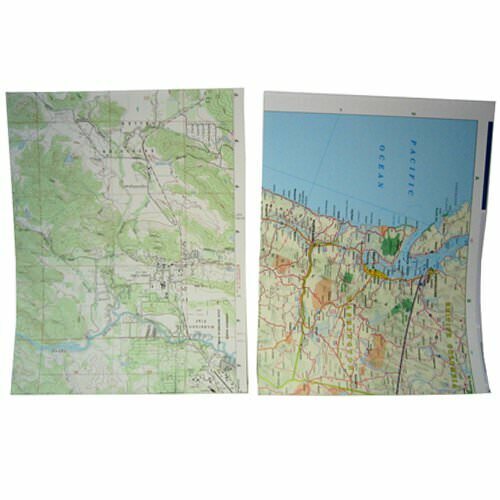 Map Paper measures 8 1/2 x 11 (standard piece of paper size) and comes in packs of 25. Note: Map Paper is made from real maps. Please keep in mind that all packs are assorted and it is not possible to buy specific map locations. Check out how to use our map paper and envelopes!